← Starting fresh in 2017. New blog focus. This weekend was the beginning a new era for the United States. However you might feel about it, good or bad, a new beginning can always be a time for reflection. I am renewing and strengthening my own commitment to living a fully ethical life. So today’s post will be on how I kept my commitments while also spending as little as possible. This weekend was also the start of my budget for this month. My budget runs the 17th to the 16th of each month. (More on budgeting soon) I had waited to buy a number of things until a new budget, since last month I had to spend a lot of home repairs. (i.e. I had no heat for three weeks!) One of those things I was waiting to buy was shampoo/conditioner since I have enough, but I am on my last bottles. So this month I planned/budgeted to spend $50 on beauty supplies and then I checked the ads. 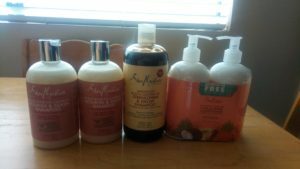 For most of January, at Ulta, Shea Moisture was on sale, buy one get one 50% off and there was a coupon for $3.50 off $15 purchase. It was buy one get one 25% at Target and the prices were a little less, so I thought I would combine my errands Friday night and get Shampoo at Target. But when I went into Target, they said that deal was only online, and there was nothing on the clearance end caps. Ulta is right next to Target near where I work, so I thought I would go in and see if there was any clearance at Ulta. And am I glad I went into Ulta! When I got there, there was a buy one get one free of conditioner in a special pack. So I got all this for $33. All of these are Fair Trade, Sustainable and have a community impact on the lowest levels of the supply chain. This is about $6.50 per bottle, and the Jamaican Black Castor Oil Shampoo is 16.3 ounces so its a larger bottle for the same price. Regular price on these bottles is $10.99 at Ulta and around the same for these particular lines at Target (there is a less expensive shampoo for $7.50 a bottle). Now I bought a lot of shampoo because they had the Rose in stock which I have been wanting to try, so I went ahead and bought it. But on a tight budget I could have just gotten the two pack of conditioner, the Black Castor Oil Shampoo and paid only $5.50 per bottle. I also could have come back a different day a bought the second two bottles of Rose Shampoo with a new coupon and saved another $3.50 total on this purchase. Now for me because of my busy schedule, it was worth the $3.50 to not have to come back again or use another trip for deep conditioning mask, but there was a time when I would have made multiple trip OR asked the cashier to run me multiple transactions. Basically the buy one get one free was a super find! I always check the racks at Ulta for ethical choices, on clearance. Particularly since they also carry items from The Body Shop. Once I got a tin of solid Argan oil, which I use on my hair or as lotion for $0.o1 on clearance. These kind of steals making buying ethical a lot easier and more affordable. And needless to say I won’t be buying shampoo or conditioner for likely another six months! I will have to buy some masque sometime soon but I will keep an eye out for a good sale like this one. Once I found masque on clearance at Ralphs for $5. The key to this life is budgeting so you have funds to take advantage of these sales when you see them. Let me know what amazing deals on ethical goods you have found!